Maryland governor Larry Hogan was elected to make the tough choices. In this case, to spend less taxpayer money on schools, and more on prisons for underage offenders from Baltimore. “Given how the needs of our children have been highlighted by the events of the past few weeks, I hoped that the governor would have agreed with the General Assembly that these dollars are critical for expanded educational opportunities,” Baltimore Mayor Stephanie Rawlings-Blake, supported by the teachers union, said in a statement. Hogan accused the teachers union of launching “a heavily financed smear campaign” against him. The now-you-see-it, now-you-don’t education money was part of about $200 million lawmakers set aside for their top priorities: school funding, preventing a pay cut for state workers and paying for a range of health-care initiatives that include Medicaid coverage for more pregnant women and funding for heroin addiction. Governor Larry Hogan, in addition to cutting out that $11 large directly from education funding, also made the tough choice to spend $30 million on a 60-bed jail for Baltimore teenagers who have been charged as adults. And who but Larry Hogan, the guy who declared a state of emergency and used the National Guard to place Baltimore under siege following the police murder of Freddie Gray, would know more about Baltimore’s need to lock up more kids? 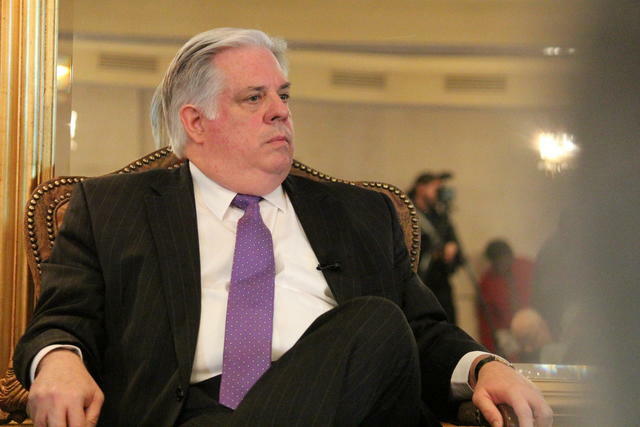 Actually, Larry Hogan knows very little about Baltimore’s need to lock up more kids. The city’s rate of youths jailed as adults dropped in recent years. State officials said in March that the city detention center holds fewer than 20 minors on any given day. See how great that is? Rather than providing for better schools that holdout at least the possibility of reducing youth crime, Governor Larry Hogan will instead create more classrooms inside jails. See, Peter, kids are really nasty little rotters. I’m sure Mr. Hogan had just viewed “Lord of the Flies”, which informed his most protective-posture position. And that is where it’s at, today, right? Pro-tect-ive postures, while we natter away on our little devices, unaware of what happens outside of our little self-created cocoons. But we’re pretty sure everyone else is revolting (double entendre), so there has to be a place to corral them. God bless you, Mr. Hogan. Yeah, that’s my governor. How he got elected here is the same old tired story we are hearing all over the place: the Democrats ran a bad candidate (on purpose), and ran a bad campaign (on purpose), and presented no good ideas (on purpose). I think it comes down from on high somewhere. Every state is going to become Kansas or Wisconsin, every governor will be a Kasich, a Walker, a Brownback, a Scott, a Synder, a Christie… More and more states are heading toward a future of privatization, corporate takeover, lower taxes for the wealthy, etc. In the fifty states, we now have 31 Republican governors, 1 Independent, and 18 Democrats. The state legislatures are similarly stacked, with more Republican-dominated Houses and Senates than at any time since just before the Great Depression. Some of our state legislators are questioning that what you have written about in this article (Hogan’s unilateral decision) is even legal. Of course, legality didn’t stop him from issuing a decree suspending Maryland’s habeas corpus law during the Baltimore protests. He has a lot more planned for Md’s future, and none of it is pretty. BTW, the education fund cut is aimed directly at our largest Black communities: Baltimore County, Baltimore City, and Prince George’s County. This is not by accident. Hogan wants some of the funds from the public school system to go to private religious schools instead. Oh, and he spent some of the funds to hire 100 new cops for Annapolis. You can never have too many prisons or too many cops.